Cornel Somogy, an engineer by profession, took photographs at the Maxwell Street Market. He was particularly struck by a death mask painting of former President John F. Kennedy (JFK) at the Market, who was assinated in 1963, as described in his words: “JFK visited Chicago during the fateful week of our confronation with the Cuban missiles at the end of Oct. 1962. 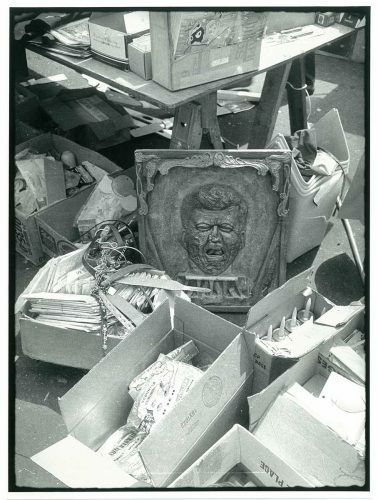 Three years later his “death mask” by an unknown artist was for sale on the Maxwell Street flea market. All images published by the Maxwell Street Foundation within this website are copyright of the artist and are for educational, personal, and/or noncommercial use only. For any other use, please contact gro.n1555618665oitad1555618665nuoft1555618665eerts1555618665llewx1555618665am@of1555618665ni1555618665.